I love dogs and I love hedgehogs but sadly I am seeing an increasing number of hedgehogs coming into rescue after being attacked by dogs. Many hedgehogs are injured by dogs in private gardens and in parks and countryside when out on walks. A number of hedgehogs I have admitted with bite wounds have been from gardens on the edge of city parks. Hedgehogs love to live in the piles of leaves that dogs love sniffing through. The problem is that dog canines bite deep into the hedgehog. The wound then quickly seals over and can then be hard to spot. Many people let the hedgehog go again thinking that it is okay. Then, up to several weeks later, abscesses appear when the deep wounds get infected. A hedgehog with an abscess will struggle due to the infection and then often succumb to other problems, such as an increased parasite burden and it is a downward spiral, ending up with the hedgehog struggling and then being seen in daylight (when they are nocturnal). There is also usually more than one infected wound – all four canines will normally puncture the hedgehog. Hedgehog with a burst abscess. This hedgehog had 8 abscesses caused by individual puncture wounds from teeth. Treating abscesses requires a lot of TLC. The abscesses will have to be cleaned daily. Deep abscesses may also have to be drained by a vet. The hedgehog will have to be put on a strong antibiotic. Although dogs are a major cause of bite wounds, there are also other animals that can attack them, including foxes and rats, although rat attacks are rare. Cats don’t tend to cause problems for hedgehogs. The best way to prevent dog attacks and dog bite wounds in your garden is to ideally keep the dog out of the garden at night. If you do need to let it out, then keep it on a lead. Always check for hedgehogs first. Turn an outside light on before you go out, which will also help to encourage any hedgehogs to move away. You need to be particularly vigilant if your dog has attacked a hedgehog before. It will likely do so again. If your dog does pick up a hedgehog when you are out on a walk, it is always best to get the hedgehog checked over by a rescue, particularly if you see any blood on the dog or hedgehog. As well as attacking adult hedgehogs, dogs can also disturb hedgehog nests so it is particularly important to be vigilant around the breeding season from May to September. You may have a hedgehog nest in the garden that may be disturbed by a dog even during the daytime…. A hedgehog nest in a pile of leaves – vulnerable to being disturbed by a dog. This nest has sadly been disturbed – the hedgehog and hoglets should not be out in the open. I run a hedgehog hospital in York, England. My work is entirely self-funded. 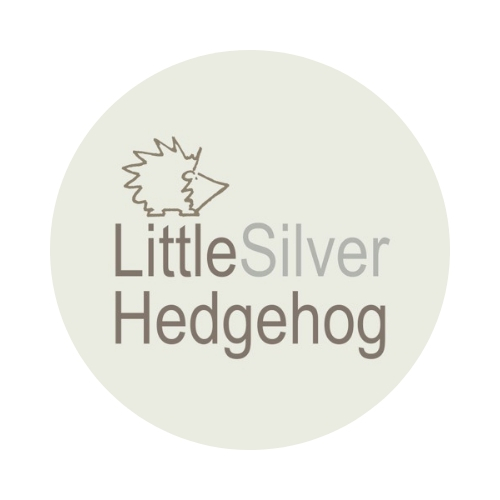 You can support my work by making a donation or purchasing my handmade silver jewellery that raises funds for my hedgehog work. I am pleased to say that both the hedgehogs featured in these images have made a good recovery. Very helpful article. I have also noticed an increase in the numbers of hedgehogs attacked by dogs over the past 27 years. The culprits are mostly border terriers or jack russells. I was about to ask if there was a particular type of dog. We’ve always had labrador/spaniel types who back off after getting their noses prickled so I used to assume that hedgehogs were well defended against nosy dogs, but sadly it seems they are not. Well done for a well-written & restrained article. I am gutted to say my terrier attacks hedgehogs and we have had to take more than hog to be checked by the vet. It is a very traumatic experience for the hog & us (but obviously more so for the hog). I am now muzzle-training our dog as it is proving impossible to be sufficiently vigilant – we are lucky enough to have a healthy hog population in our village, so temptation is everywhere. Our dog is not taking well to it (she is a rescue with ‘strong breed traits’, so may have been used for hunting in her past), but I have no choice but to keep trying. Btw, Blue Cross have a good video on their website re muzzle training using the ‘Baskerville’. Thank you so much for your comments. I am truly a dog lover so I am really keen to help spread the word and some are genuine accidents. Others could have been prevented easily with some information. It is so very hard when they are a ‘hunting’ type dog and you obviously do want them to be able to be as free to run as possible. I will take a look at the muzzle training. That would be a good idea and link to add to the blog. Thank you! My rescue terrier, which is a Westie crossed with Lakeland attacks virtually anything that moves, but especially hedgehogs, squirrels, rabbits and pigeons. I’ts a hard-wired, inbred tendency which we have never been able to suppress or train out of the dog. That’s his purpose in life. As we have a large population of hedgehog visitors to our garden we always put a lead on him when we take him into the garden.